Algae are responsive to the physical and chemical conditions in the aquatic environment. Sometimes their rapid reproduction causes nuisance growths or blooms. Most blooms occur when favorable environmental conditions exist, such as an extended photoperiod during summer, sufficient nutrients, and slow moving or stagnant waters. Algal blooms have dramatic effects on water chemistry, most notably pH and dissolved oxygen (DO). When algae remove carbon dioxide during photosynthesis they raise the pH by increasing the level of hydroxide. The opposite reaction occurs during respiration when carbon dioxide is produced lowering hydroxide and lowering the pH. Therefore, high pH (> 8.0) can be an indicator of photosynthesis by large quantities of algae. Algal blooms produce large amounts of oxygen during photosynthesis that may lead to supersaturated levels of DO in the water column. Conversely, during respiration, algal blooms remove the DO from the water column which may lead to little or no oxygen in the water column. These conditions can also be created when a large quantity of algae die and decompose. Supersaturation of DO (> 110% saturation) can also be an indicator of photosynthesis by large quantities of algae, particularly during mid-to-late afternoon. 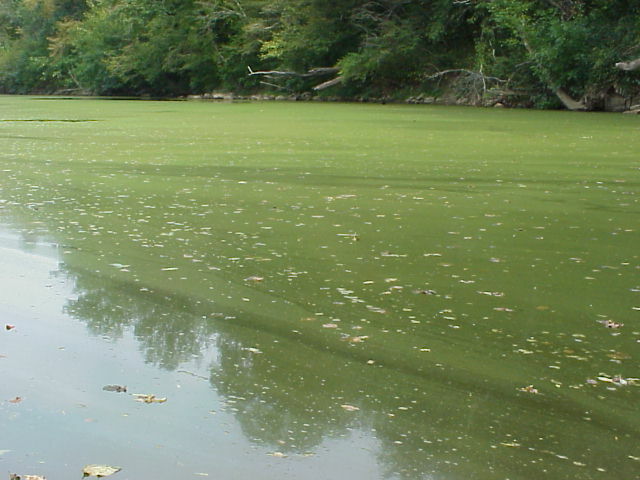 Algae are a concern in drinking water supplies and reservoirs. Some algae, such as Microcystis, produce toxins and have been linked with the deaths of livestock and domestic pets*. They can also cause taste and odor problems, water discoloration, or form large mats that can interfere with boating, swimming, and fishing. Algae and their blooms may be associated with fish kills. *Blue green bloom cautions...Questions concerning possible human health effects should be directed to Mina Shehee, Harmful Algal Blooms Coordinator, N.C. Dept. of Health and Human Services.